Union Square San Francisco is in the heart of the city. This thriving neighborhood is a mix of locals and tourists and offers dozens of fun things to do. It's a popular place to stay on a trip here as its the district with the largest concentration of hotels with easy access to places all around SF. Top activities here including shopping, theater productions, galleries, tours, and fun bars and nightlife options. This is also where you will find the cable cars that run between this district and Fisherman's Wharf. 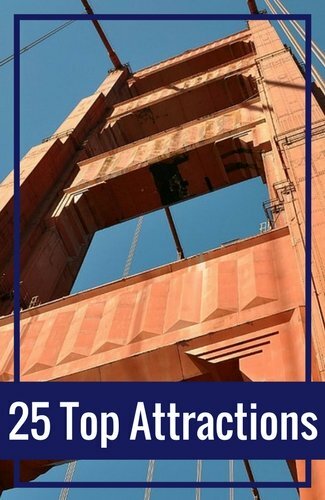 Use my insider's guide to find everything there is to do in this popular SF area. 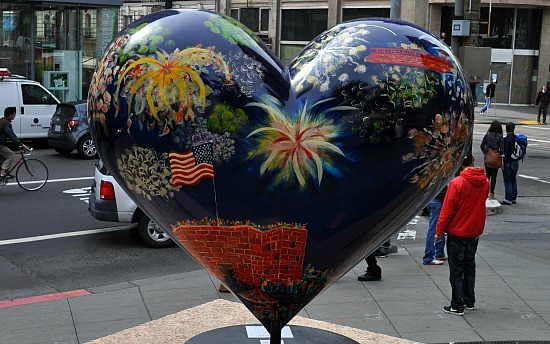 The hearts you see on the square rotate frequently. It's a fund-raising campaign for a local hospital. When someone buys a new heart, it will spend a week or two before it moves to its permanent home. 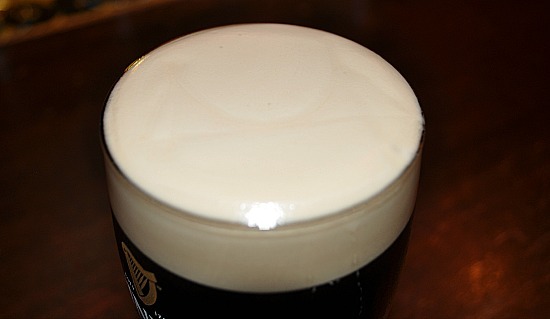 The one in the picture above is the only full-time heart here. One of the top draws to Union Square San Francisco is the shopping. You will find high-end shops all around the square as well as shopping throughout the district. Here are some popular options throughout the district. Around the Square: The four-block radius around Union Square is home to several high-end retailers. Long standing shops here include Louis Vuitton, Tiffany's, and Macy's. Along these streets, you will also find Sak's Fifth Avenue, Neiman Marcus, and Gucci. Maiden Lane: One of the most famous shopping streets in Union Square San Francisco is Maiden Lane. This high-end street houses retailers such as Chanel, Marc Jacobs and Yves Saint Laurent. I love this two-block long lane during the day when it's just for pedestrians (11am to 6pm). This is also when the cafes and small restaurants on Maiden Lane set up tables and chairs outdoors for a lovely lunch experience. Powell Street: Another large concentration of retailers is along Powell Street. 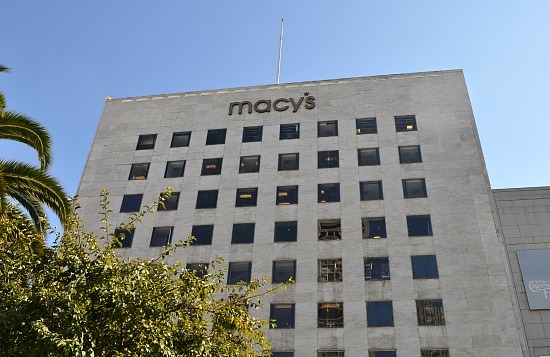 Between Geary and Market Street you will find trendy retailers such as Sephora, Urban Outfitters, and UNIQLO. Other shops on this area of Powell Street include H&M, LUSH, and Express. Throughout the Neighborhood: Most of Union Square San Francisco is dedicated to high-end brands. Other top shops you will find throughout the district include Burberry (225 Post), Brooks Brothers (240 Post), Dior (185 Post Street), 7 for All Mankind (224 Grant Avenue), and Dolce&Gabbana (100 Grant Avenue). Westfield San Francisco Center: Just across Market Street from the Union Square District, you will find a large shopping mall called Westfield San Francisco Centre. It's also focused on upscale merchandise and brands. This is where you will find additional shopping with anchor stores Bloomingdale's and Nordstrom's. You will also find shops such as Abercrombie & Fitch, Banana Republic and Michael Kors. You will find two of the three cable car lines running through Union Square. Both take you up and over the steep hills of San Francisco to the Fisherman's Wharf District. It's fun to watch them head up and down Powell Street full of riders from around the world. One of the main attractions in this district is the cable car turnaround. It's fun to watch the cable car operators hand spin the cars around so they can begin their journey back to Fisherman's Wharf. Powell/Mason Cable Car: The Powell/Mason Cable Car runs between Union Square and the eastern end of Fisherman's Wharf. 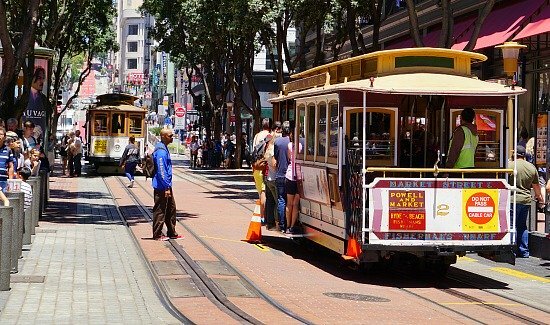 Stops along the way on this cable car include Chinatown and North Beach. The final stop for this car is at Taylor and Bay Streets. This ride takes about 25 minutes. Powell/Hyde Cable Car: The Powell/Hyde Cable car also runs between these two popular districts. However, this one heads along a different route. It will take you up Powell Street, through part of Chinatown and up Washington Street. It then turns down Hyde Street where you will pass Lombard Street before your final descent down a large, steep hill and into Fisherman's Wharf. This one takes a little longer, almost 30 minutes, but it's my favorite of the two. It climbs and descend on stepper hills and I love the views from this one as you head down that final hill into the Wharf. Local's Tip: If you don't have time to wait in line, but really want to ride a cable car, then head to one of the other stops along Powell Street. On most cars, they leave space to pick up people along the way. You won't get the best seats, but you will get to experience a cable car ride without spending an hour or more waiting in line. Union Square San Francisco is also home to several great theaters with live performances. They feature Broadway shows, Off-Broadway hits, world premiers, experimental productions, and locally written and produced pieces. Golden Gate Theatre (1 Taylor Street): The Golden Gate Theatre is one of two San Francisco theaters (the other is the Orpheum) that solely show Broadway productions. These are all traveling shows from New York with actors either from or on their way to Broadway. You will find many rising stars in these productions and they offer a high-quality experience. The Golden Gate Theatre offers about half a dozen shows each year. Here are their upcoming shows. Curran Theatre (445 Geary Street): The Curran originally opened in 1922 and offers gorgeous details both inside and out. It's famous for offering more pre-Broadway shows than any other theater and was where Wicked started before moving to Broadway. Today, this theater offers a few, hand-picked performances. Some are experimental shows and others are straight from Broadway. They offer about five to six performances each year. American Conservatory Theater (415 Geary): The American Conservatory Theater, often referred to as the ACT Theater, is a non-profit theater about a block away from Union Square San Francisco. At this theater, you will find both classical and contemporary productions. Their schedule includes more than a half dozen shows each year including their annual showing of A Christmas Carol in December. In addition to shows, they are also an acting school. San Francisco Playhouse (450 Post Street): The San Francisco Playhouse is another non-profit theater. They feature nine shows each year. This 199-seat theater shows Broadway and Off-Broadway productions, musicals, and both regional and world premieres. Performances are offered Tuesday through Sunday. The following four theaters offer smaller, more intimate settings. These productions are easy on the budget and offer many lesser known productions. Custom Made Theatre (533 Sutter Street): Just over a block from Union Square San Francisco, the Custom Made Theatre is a 99-seat facility. They often focus on shows with a political or social commentary although they also mix in light hearted comedies, dramas, and other pieces. Exit Theatre (156 Eddy Street): The Exit Theatre is a small space that features a variety of productions from local artists. It's a place for local actors to perfect their craft. You will find theater shows, festivals, magicians, and more on stage here almost every night of the week. They also have other smaller venues around downtown SF, so make sure to check your tickets for the location for performances with the Exit Theatre. Phoenix Theater (414 Mason Street): The Phoenix Theater is another intimate venue with performances by local artists and emerging playwrights. Their goals are to create excellent shows that are affordable. 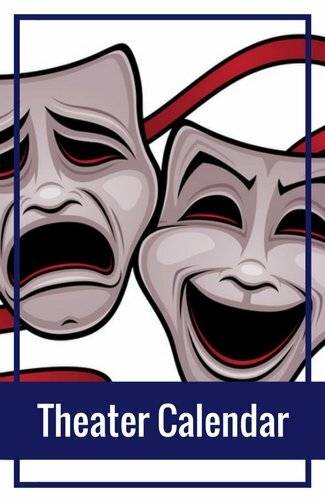 Make sure to visit Goldstar to check out some of the great deals for upcoming theater performances around Union Square San Francisco. These are just a few from around town. 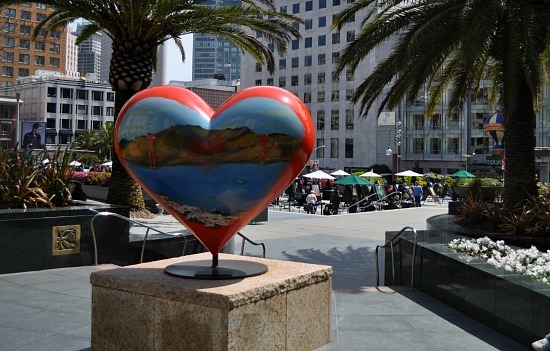 If you want to learn more about Union Square San Francisco, you will find a variety of tours in and around the district. 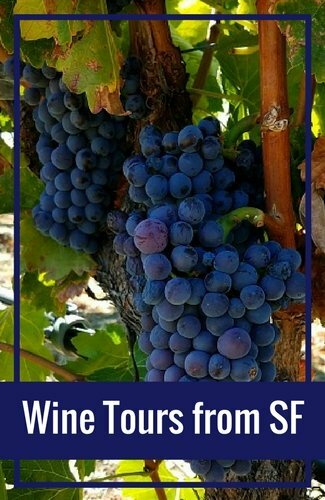 In addition, you will also find several other tours that either start here or drive through as they visit several places throughout San Francisco. These are the top tours that focus most of their time in the district. Emperor Norton's Fantastic SF Time Machine Walking Tour: This fun and interesting walking tour is given by a historic San Francisco figure, Emperor Norton. In the mid-1800s, Emperor Norton was a wealthy businessman that lost all of his money in a bad investment. To remain relevant, he declared himself the Emperor of the United States and Protector of Mexico. The city and its residents didn't push him aside, but instead embraced him. On this tour, your guide, Emperor Norton will tell you all about "his" life and what San Francisco was like during the 1800s and early 1900s. It's a tour like no other and one you will not soon forget. The tour is about 2.5 hours and you will walk 2 miles. Find tickets at up to 50% off for this tour on Goldstar. Haunted Tour: If you prefer to learn about SF's dark history, then you are in for a treat. This 75-minute tour will take you down this district back alleys, haunted sites, and tell you stories of murder, mystery and mayhem in SF's past. You will hear about famous murders, walk down a high-end shopping street that was once full of brothels, and learn all about the famous people that were involved. This tour is not recommended for children 10 and under. This tour runs several times a week. Check for ticket availability on Viator. Cocktail Tour: Are you interesting in checking out some of the best Cocktail bars in Union Square San Francisco? If so, then you will love this guided Cocktail Tour of the district. On this 3-hour walking tour, you will stop by 3 cocktail bars. At each one, you will sip on a handcrafted cocktail paired with small bites as you learn more about it and the establishment from your guide, the bartender, and the owners. This small group tour is for adults 21+ only. Leaves most Saturday nights at 5pm. Check for ticketing availability on Viator. 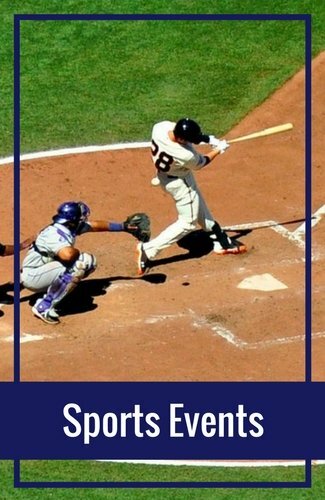 Free SF City Guides Tours: SF City Guides, part of the SF Public Library, also offers free walking tours in and around Union Square San Francisco. These two-hour tours offer you the chance to learn more about what has shaped this district over the years. Tour topics include the 1906 Earthquake & Fire, the architecture of the district, and more. Learn more about these and other tours offered daily by SF City Guides. These are the tours that start, end or offer stops in Union Square San Francisco. 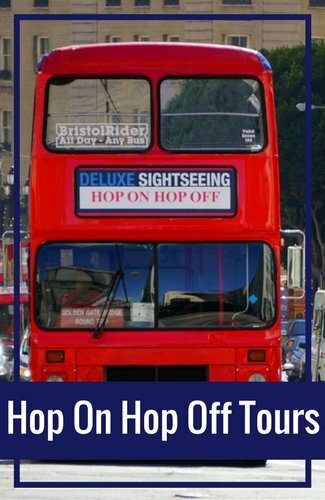 Hop On Hop Off Tours: The Hop On Hop Off Bus tours are a great way to get around from attraction to attraction. These tours usually offer 20 to 30 stops and all of them have a main stop right in Union Square San Francisco. You will find a variety of agencies offering these tours all with slightly different offerings. You can learn more about the options here. You can either buy the tickets when you arrive or online in advance. City Sightseeing offers a $5 discount per ticket when you buy your in advance online. Their two-day tour is the most popular. Check their site for ticketing information. 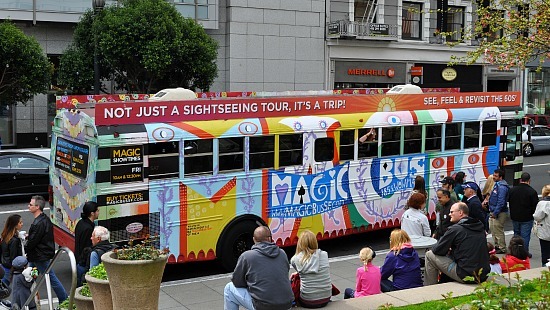 Magic Bus: Have you always wondered what San Francisco was like in the 60s? During this colorful decade, SF played an important role in the counter culture of the time. It was the location of the large Summer of Love festival, it was home to many in the Beat Generation (also called Beatniks), and so much more. 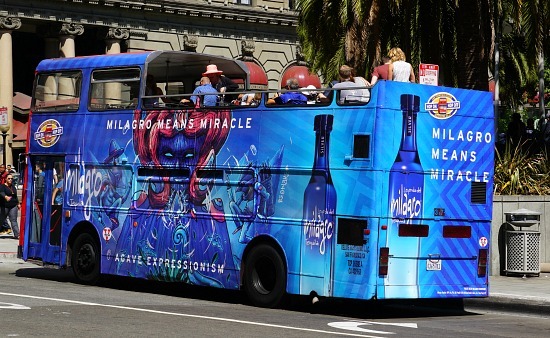 Find out what it was like during this time in SF on the Magic Bus. This cool vehicle is decked out in 60s colors and you will see video clips on the areas you drive through on their over the window screens. It's an amazing experience and one I truly enjoyed. Get tickets on Viator today. These are the tours that make their way through the district. Many of these may not stop here, but drive through and offer some great history and details about this popular district. Movie Sights Tour: What movies can you name that were filmed in San Francisco? Top movies filmed at sights around SF include Zodiac, Moneyball, Bullitt, Mrs. Doubtfire, and many, many others. On this 3-hour tour, you will cruise through the streets from movie sight to movie sight including some that were filmed in Union Square San Francisco. Learn more about this tour and check for ticket availability. Double Decker Night Tour: The Double Decker Night Tour offers a look at this gorgeous city at night. You will ride through Fisherman's Wharf, Chinatown, and Union Square San Francisco. You will also have photo opportunities at the Palace of Fine Arts, California Street, and the Bay Bridge Lights. The tour departs at 7:30pm nightly and is run by City Sightseeing. Visit their site for details. 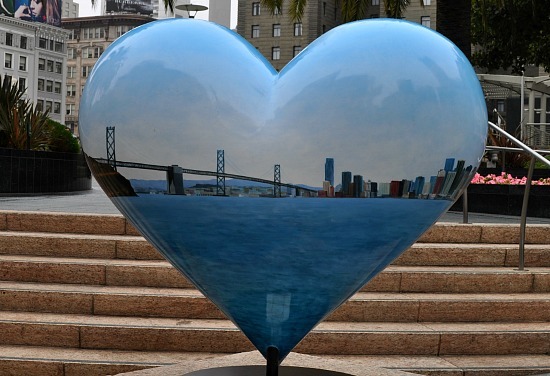 City Tour: This 3.5-hour tour gives you the chance to visit many different neighborhoods throughout San Francisco. You will cruise through Fisherman's Wharf, Chinatown, Alamo Square, and Union Square as well as others. 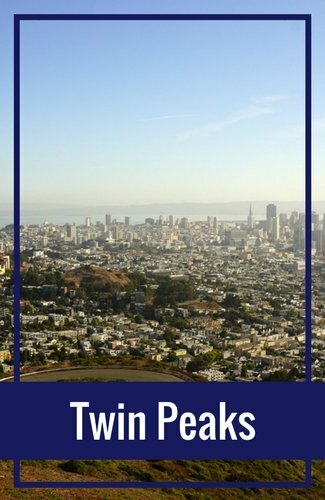 This guided tour will also take you to the top of Twin Peaks (weather permitting) and Golden Gate Bridge for some gorgeous views. Learn more about this tour and ticketing availability. Union Square San Francisco is home to a variety of galleries. You will find them throughout the district. Some offer antique pieces, while many offer fine and contemporary art. Here are just a few to check out during your time in this district. Martin Lawrence Galleries (366 Geary Street): Fine arts gallery with pieces from famous artists such as Picasso, Dali, Rembrandt, Andy Worhol and others. Kertesz Fine Art Gallery (535 Sutter Street): A variety of fine arts paintings including Impressionist California landscapes, oil paintings with impressionist and realist styles from the 19th and 20th Centuries. 49 Geary Art Galleries (49 Geary): Two floors of art with photography, paintings, and more, they have some of the best First Thursday parties in town. Dolby Chadwick Gallery (210 Post Street, Suite 205): Here you will find both emerging and established artists. They have a variety of works and their exhibits are always changing. There are dozens of restaurants in the Union Square San Francisco neighborhood. You can find everything from fine dining at the famous chef Michael Mina restaurant to more casual places such as Farmer Brown. It seems like there is a new restaurant opening everyday -- so there is always something new to try. 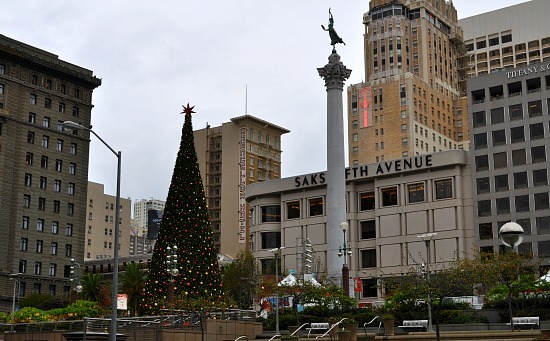 The largest concentration of hotels is in the Union Square San Francisco neighborhood. They range from smaller and cheaper two-star hotels to five-star hotels with all of the amenities. You will also find a number of nationally and internationally recognized names such as Marriott, Sheridan and Hyatt. The Westin St. Francis San Francisco on Union Square (335 Powell St): Directly across the street from Union Square San Francisco is The Westin St. Francis. This large hotel almost 1,200 rooms and offers 4-star amenities. Find a room on Booking.com. Hotel Rex (562 Sutter Street): About two blocks away from the heart of the district, this 3-star hotel offers some of the best bang for your buck in this area. 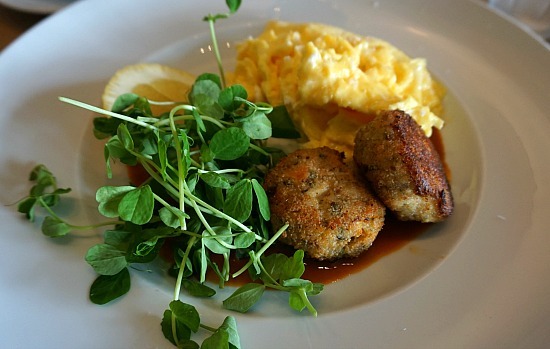 This historic hotel is well located next to transit, the cable cars, and fun things to do. Find a room on Booking.com. Hotel Spero (405 Taylor Street): A five-minute walk away is Hotel Spero. This 4-star hotel offers parking on-site, 24-fitness room, and a restaurant on the first floor. Find a room at the Hotel Spero on Booking.com. Union Square San Francisco hosts a variety of events throughout the year. These are just some of the biggest and most popular ones that take place right in the main square. Union Square Live: This Summer event offers two shows a week on Wednesday and Sunday from April to October. Performances include local bands, dance companies, and more. All are free and open to the public. Learn more here. Christmas Tree Lighting Ceremony: This area of town is beautifully lit for the holidays every year. The official kick off is the day after Thanksgiving during the annual Christmas Tree Lighting Ceremony. The event includes activities and a lighting of the tree at around 6:40pm. More details here. Bill Graham Union Square Menorah Lighting: Every year, you will find a huge menorah on the square. All eight candles are lit according to that year's calendar. This event also features a Bill Graham Menorah Day, usually on the same day as the lighting of one of the candles. Santa Con: If you happen to be walking around Union Square San Francisco in December and are surrounded by hundreds of Santas, then you are here for Santa Con! This fun event started here and is so popular, you will now find it at locations around the world. It's a fun event that starts with a meeting in the square and moves to bars throughout the city. More on Santa Con. Find more events throughout SF each month. In addition to theater shows, tours and heading out for a nice meal, here are a few additional things to do at night in Union Square San Francisco. August Hall (420 Mason Street): This historic venue was renovated and reopened in December 2017. It offers three fun activities: music hall with concerts several nights a week, a cocktail bar (Green Room), and three lanes of bowling (Fifth Arrow). These are a few of their upcoming shows. Biscuits & Blues (401 Mason Street): This blues club is one of the best in the US. You will find it just one block away from the heart of the district. They offer live music most nights of the week and some of the best fried chicken in town. You will also find a great selection of local wines, craft beers, and cocktails. Find tickets for most shows at up to 50% off on Goldstar. Magic at the Marrakech Magic Theater (419 O'Farrell): Magician Jay Alexander is the new headliner at the Marrakech Theater in downtown SF. His show, Mind Tricks, combines magic, comedy and mentalism. He offers shows most nights of the week. Find tickets at up to 50% off on Goldstar for most shows. From Fishermans Wharf/Pier 39: There are several ways to easily get here from Fishermans Wharf. Cable Car: Taking a cable car is the most fun. There are two cable car lines that run between Fishermans Wharf and Union Square. The cost is $6 per person. It takes about 20 to 25 minutes to get there using the cable cars. F Streetcar: Another option is to take the F Streetcar. This option only costs $2 per person. It takes just a little longer - around 30 minutes or so - but is a beautiful ride along the water. From San Francisco International Airport (SFO): You can take a taxi, shuttle, or BART (the train) from SFO. Taxi: The fastest and easiest way to get from SFO to Union Square is by taxi -- but it's also the most expensive. Shuttle: Taking an airport shuttle from SFO to Union Square is more cost effective. There are about a dozen companies that run shuttles to and from SFO to San Francisco. BART: This takes the most time but is the least expensive. If you pack light and you don't mind walking a little, this is a great option. From Oakland Airport (OAK)/East Bay: You have the same options for getting into the city from OAK as SFO. However, the experience is slightly different, since you need to plan ahead just a little more. Also, it costs more money and will take a little longer when traveling from OAK to Union Square San Francisco. You will find parking all around Union Square San Francisco. The challenge is that it is quite pricey. 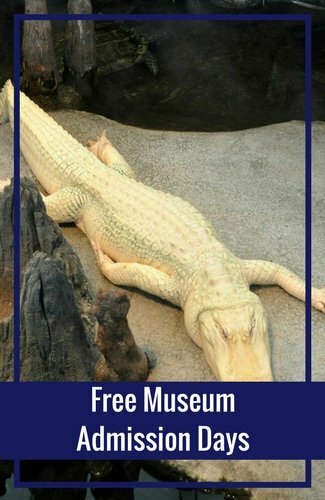 Here are a few options that are centrally located to all of these fun things to do. Union Square Garage (333 Post St): Under the square is a large parking garage that offers several levels of underground parking. Westin St. Francis (335 Powell Street): Located under the Westin St. Francis hotel, this garage has room for 300 cars. It's one of the most expensive options, but you can usually find parking here. Sutter Stockton Garage (444 Stockton Street): This is one of the largest (1,800+ spaces) and best priced garages in the area.